Blogger Confessions: How Long Do I Think I Will Blog? ~ Love.Life.Read. Blogger Confessions: How Long Do I Think I Will Blog? A bimonthly posting, For What It's Worth and Midnyte Reader post questions on the first and third Monday of each month for us to respond to and link back to their sites. For a list of upcoming questions, go here. April 15th - How long do you see yourself blogging for? Do you think it's ok for a blog to evolve over time? For example: You may have started out as a book review blog but now your interest is in cooking as well. Do you incorporate that or start over? This is an intriguing question to answer. I do not know any blogger really out there who anticipates not doing this for quite some time but I know life circumstances certainly can cause this to change. I think for me personally, as I do this for myself to keep track of the books I read as well as to connect with readers, I see myself doing this for quite some time. As far as blogs evolving, I think that is natural too. I mean, we may start out reading all types of books but then focus onto one certain genre or audience. We may start pulling in other interests. For me an example might be librarianship as a whole, sewing/crafting in general, or cooking. Those are other interests I have and do play into my daily life. I do not anticipate anything other than bookish topics taking place here as that is the purpose of my starting Love.Life.Read. Piggy backing off these questions, how many of you reading this maintain multiple blogs? 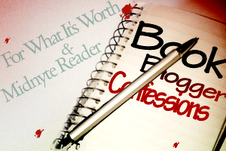 Do you have more than one book blog and if so, why? Very interesting question and something that actually came to mind naturally this morning for me. Before I started blogging, I never realized how many book blogs are out there so I was curious to know how many stick around long term. I only just started blogging a couple weeks ago but so far I love it and can see myself keeping it up. It is a great way to force myself to think more when I read and I love connecting with other bloggers and learning about new books. Thanks for stopping by my blog - following back! I love it too but it is work too so as long as I can keep up with it, I will be doing it. :) Thanks for stopping by and following. One blog is enough for me right now and I would probably connect it to my current blog. I was on a cooking bender a few years ago and reviewed a couple of cook books complete with pictures of my successes and failures. I think as long as you keep it fun and interact with your followers it's all good. Yeah, I can only imagine the heated discussions that must have gone on it. One blog is enough for me too...I have one that is there if I ever want to do anything with it but I don't have the time for it. Thanks for stopping by and Happy Reading Karen! Thanks for stopping by Julie and Happy Reading! I only manage this one blog that is totally book-related, its focus being on reviews...mantaining multiple blogs would be tricky, not to mention that, though I have other interests (mainly music and crime tv series), it's not like I feel the need to talk about them at this stage. The reason why I started a book review blog was to spread the word about some less celebrated novels that I thought worthy of attention...Of course, once you have a blog, it becomes personal even if it's not a journal. I have this feeling that mine could evolve in some way - though not losing its purpose - only I don't know how yet...For now, like you, I'm just enjoying the ride :). It's so cool that you're a librarian. Was it your career choice from the start? Thanks for stopping by Roberta and Happy Reading! Only one blog, but I have thought about splitting my horror reads with all my other reads...but decided against that. I think it's normal for a blog to evolve and change just as people do.